Jewish humor has always been one of my favorite topics to teach. I've taught classes about Jewish humor and Jewish comedians to teens and adults at many different settings including synagogues, Jewish camps, and on college campuses. As an aspiring stand-up comic, I have always been interested in the history of Jewish humor, what makes a Jewish joke funny, and why there have been so many successful Jewish comedians throughout the generations. A sketch on last night's episode of Saturday Night Live (SNL) provides much food for thought about Jewish humor. The SNL sketch parodies a lavish bar mitzvah for the nephew of a Hollywood exec that has performances by Taylor Swift (played by Gwyneth Paltrow), Jay-Z and Alicia Keys, Katy Perry, and Cee Lo Green. Jacob, the uncomfortable bar mitzvah boy, repeatedly claims that he told his father that he would have been content with just a "modest luncheon." The sketch is funny, but it also relies on some age old Jewish stereotypes that many will claim have run their course and aren't funny anymore. When it comes to comedy, is everything fair game? I've always taught that ethnic humor has to have at least a hint of accuracy for it to be funny. There will surely be those who are offended by the many JAP (Jewish American Princess) references in Gwyneth Paltrow's Taylor Swift impersonation in the bar mitzvah sketch. Parodying Taylor Swift's song "You Belong With Me," Paltrow sang: "She's in synagogue with her new clear braces on / I'm sittin' shiva with no mirrors to put makeup on / She doesn't get your Mel Brooks humor like I do / She wears Macy's, I wear Loehmann's. She wears Filene's and I wear Filene's Basement / Can't you see? She's just a JAP. Not like Japanese." Up next performing at Jacob's bar mitzvah was SNL comic Jay Pharoah (a last name that could be offensive to Jews, but isn't) appearing as Jay-Z and singing his bar mitzvah version of "New York State of Mind" with Alicia Keys (Nasim Pedrad). He opens with the words, "While we read the Torah / Just to learn the word of God / Straight from Deuteronomy... Rabbi Josh Levi / I'm straight up withcha." He then utters what I would imagine is the first reference to the Mishnah on late night network TV. Pharaoh (as Jay-Z) then gives a deep reference to both biblical kosher law and the theological perplexity of God's ego: "Everything ain't right cuz it's dirty as shellfish / Don't defy Yahweh cuz he's mad selfish." As if this SNL sketch couldn't get any more Jewish (or as Jon Stewart often says: "Jewy"), Jewish SNL cast member Abby Elliott sends up Katy Perry doing her Jewish version of "California Girls." She enters with "Hi everybody, happy Jewish!" and then busts into the lyrics "Jacob just read from the Haftorah / Let's all dance the Hora... Ashkenazi Jews they're so incredible / And Sefardic Jews are cool too / West Bank represent despite your violence... Shalom you guys." 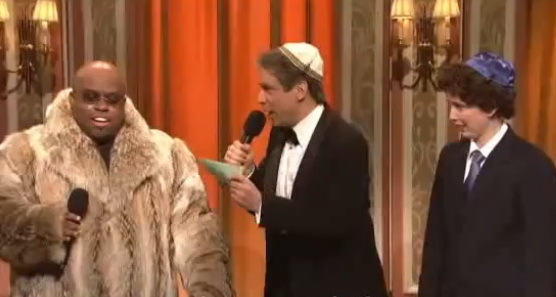 Next, Cee Lo Green enters the bar mitzvah party in a giant fur coat singing his "F.U." song, but with lyrics about the Hebrew language and how it sounds like gargling. He's introduced by Jacob's father who believes Cee Lo Green's a "member of the tribe" based on his last name, but then says, "Or maybe not." Referencing the ongoing joke about the older kids at the bar mitzvah party bending the metal forks, Cee Lo Green says, "What's with this bending forks thing? I mean, that's straight up meshuganeh man!" Something tells me that Lorne Michaels and Andy Sandberg had a bet to see if they could get Cee Lo Green to say something Yiddish. The full video of the SNL bar mitzvah sketch is below. I will use it next Monday afternoon when I present a lunchtime discussion about Jewish humor at Temple Israel in West Bloomfield, Michigan. Aside from the question of appropriateness of some of the JAP jokes at the beginning of this SNL sketch, what is so interesting is that Jews only account for about 2% of the U.S. population and yet SNL devotes so much of its show to esoteric Jewish references. And this isn't an isolated example either. On Thursday night, Conan O'Brien joked that the new Disney theme park in Israel wouldn't use the nickname "The Happiest Place on Earth," but rather "It Could Be Worse." Conan then spent a couple minutes showing off his impression of a Jewish person. On Comedy Central's "The Daily Show," Jon Stewart also makes not-so-subtle references to Jewish themes on his show. Last week on one of his shows, he compared the members of Congress coming up to the microphone on the first day of the congressional session to read a line from the Constitution with "the dramatic chops of family members who demand to be called to the bimah for your bar mitzvah." I'm not sure if the Jewish writers on SNL thought Purim was much closer than it actually is, but I will say that they did a great Purim shpiel last night. Are you in favor of this type of humor or do you think that it is unfairly satirical? Hi Ted: Thanks for commenting. I love satire and appreciate satirical humor. I don't think the SNL bar mitzvah sketch is "unfairly satirical." I think it is derogatory in the 21st century to call a Jewish girl or woman a "JAP," much the same way that one wouldn't call an African American the "N word" in a derogatory way. Everything in the SNL sketch is fair game. When you mock any religious or ethnic group (and the Jewish people are both), there will be those who claim you crossed a line. There is no one (at least in North America) who wouldn't recognize SNL as a comedy show so you can't take it seriously. That being said, remember that in order for ethnic humor (satire or otherwise) to be funny there has to be a hint of truth to the sterotype. As I wrote in the blog post, there is a lot of food for thought here. The sketch didn't come out of no where. There have been several Hollywood execs who have thrown over the top bar mitzvah parties for their kids with star studded performances. Just see my 2005 post about Elizabeth Brooks' bat mitzvah titled Bat Mitzvapalooza. Also, the bar mitzvah boy telling his father in the SNL sketch that he only wanted a modest luncheon is funny, but also raises the question of who these elaborate bar and bat mitzvah parties are really for -- the pubescent celebrant (I like that term) or the parents trying to climb the social ladder. This has been driving me crazy- what does the reference to bending forks refer to? Also, I went to a college that had a good representation of Jewish students. There were some wealthy coeds who referred to themselves as JAPs. I had never heard the term before. It didn't seem lie a derogatory term to me at the time, but thanks for letting me know that it is. I think this is a general problem that SNL has suffered from for several years. At times they lose their sense of relevance. @Anonymous: The bending forks reference was just poking fun at the immature 12 and 13 year olds who haven't quite figured out how to sit politely at a fancy reception during boring speeches. 12 year old boys bend metal forks while the bar mitzvah boy's dad is giving a speech. The punchline was really when Cee Lo Green rebuked them by telling them how meshuganeh (Yiddish: crazy) it is to bend forks. Don't read into the joke any more than that. As to the JAP reference, it was more of a derogatory term in the 60s, 70s and 80s when it was uttered with some amount of anti-Semitic sentiment. The JAP joke used to be a common genre of humor, but that has really subsided. I don't think most Jews took offense at the JAP stereotyping in the SNL sketch. She's a gourmet blender cook. She's got that Jewess look. She's the Jewess in Jewess Jeans. Announcer: You don't have to be Jewish. Rhonda Weiss: But it wouldn't hurt. Announcer: Jewess Jeans. Guranteed to ride up. not half as funny as the original SNL skit about the brit. Or, for that matter, the "sure 'n' begorrah it's Purim" skit... Another generation of JAP jokes, feh! I watched the video (meh) then read the blog post and comments. With all due respect, and as a Jewish American P(erson), I do not think that the term JAP is nearly as dirty and derogatory a term as the "N" word, nor does it carry the same weight and history. As well, I would venture to say that it's a term used almost solely within the Jewish community and doubt most gentiles even got that joke (or 99% of the skit)! @Dani: I sort of agree with you. JAP isn't the N word, but then, do we really have a way to measure how offensive/derogatory a slur is? Doesn't the context it's used in matter? Doesn't the way in which it is said? Doesn't the way in which the person hears it/reacts to it? I call my daughter "my princess," but not in the context of a JAP. I don't think JAP is really that offensive but many Jewish women (and men) do. I think the SNL sketch was fine and even a little funny. Some of this is just political correctness, not that I'd ever use the N-Word. One of my favorite comedians Jim Norton (Caucasian) talks openly and honestly about the N-Word and how he can say it in a certain way and it is acceptable, but when Michael Richards uses it derogatorily AT African Americans in the crowd when he's doing stand-up, that is something entirely different.